Why should you be in Djibouti in January, 2008? Djibouti is a small nation located at the point at the Gulf of Aden, where the Red Sea and the Indian Ocean meet. It gained its independence from France in 1977 and is currently governed in a multiparty arrangement based on the French and Islamic systems of law. The capital city of Djibouti is also known as Djibouti (or Djibouti town or Djibouti city), and around 65 percent of the nation�s population lives in this urban center. It is from here that most visitors start their journeys to explore the relatively untouched, isolated, and breathtaking sights of this small yet remarkable nation. 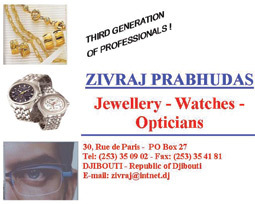 Djibouti enjoys a strong economic relationship with neighboring Ethiopia, which uses Djibouti�s port for its exports. The two nations are connected by the Ethiopian-Djibouti rail link. 1. Lake Assal: Visit the lowest point on the African continent: Lake Assal is roughly 155 meters below sea level. It is also the saltiest body of water on Earth, almost 35 percent more saline than the Dead Sea. Salt flats surround the lake where salt is mined for export to Ethiopia; they are a strange but beautiful sight. It gets very hot at Lake Assal, so remember to bring enough bottled water and dress accordingly. 2. Djibouti Town: Explore the capital city, both the traditional side (inhabited by Djiboutians) and the expatriate neighborhoods, complete with Western restaurants. Wander in the market, and observe the sale and consumption of the popular drug called khat, made of leaves of a plant native to East Africa that are chewed to give the user a sense of euphoria. 3. Moucha and Maskali Islands: These islands are about a 45-minute boat ride from the port of Djibouti town. The waters off these islands are a dream for divers: manta rays and various types of sharks live around the islands. 4. Khor Ambado: Located a 45-minute drive by four-by-four from Djibouti town in Tadjoura Bay, this idyllic white sand beach is a wonderful snorkeling spot. Explore a reef teeming with sea life just 115 feet (35 meters) from the shore. Though a popular destination for European tourists and expatriates, Khor Ambado is rarely busy. 5. Lake Abbe: This salt lake sits on the border between Djibouti and Ethiopia, at the Afar Triple Junction, where three pieces of Earth�s crust meet and form a depression in the earth. It is part of a string of six connected lakes in Ethiopia. The most impressive feature of this lake is its limestone chimneys, some of which reach heights of 164 feet (50 meters) and vent steam. Small camps of the nomadic Afar people can be found around the shores of the lake, as well as pink flamingos. 6. Gulf of Tadjoura: The best beaches in Djibouti are in this region. The town of Tadjoura has a small airport, providing easy access for tourists. That town has traditionally been a bustling port and trade center. 7. Grande Pecherie: This fish market in Djibouti town is set up along the waterfront early in the morning. Have your choice of fresh-caught fish prepared in front of your eyes. High quality and unbeatable prices: that�s certainlya winning combination for food lovers. The climate in Djibouti, a desert country, remains hot and arid year-round. Temperatures are especially high in the summer months, so we recommend visiting between October and April. Camel Caravans Are Still Worth Their Salt. Djibouti . Fashions . Camel Caravans . Wildlife .. Editorial Photo Gallery 1 - 2 - 3 . Hotel . Area . ATA . Activities . Fishing . Have you Googled Djibouti lately? By Jerry W. BirdIn our efforts to sing the praises of travel and tourism to Africa, our magazine's staff and I rely on Google as a foolproof guide and fast, accurate measuring stick. Like magic, Google is quick to advise whether our message is getting through to readers worldwide - and the process never fails. The good news? We lead the pack in a variety of Africa-related topics, beating out media rivals and many well heeled giants of the travel, tourism and hospitality scene. So when it came to Djibouti Tourism - a destination we have just began promoting in a serious way - we asked the almighty Google to search its vast domain for "Marketing Djibouti Tourism to North America?" Voila - our web site came out #1 and #2 from 251,000 entries. (Dec. 2007). Having traveled on Djibouti's doorstep during the past seven years with tours and two ATA World Congresses in neighboring Ethiopia, we are excited about this country's great potential for positive, unbridled growth. With that objective in mind we asked Google for another search, based on comments we read about Djibouti becoming another Dubai in terms of international opportunities thanks to its climate and strategic location. Again - our site was sitting in the #1 position. With our pioneer visit to Djibouti comes the opportunity to produce a souvenir edition on the country that will be well received by readers in the travel tourism industry in the USA and worldwide, that will be a showcase of positive views and scenes for this rapidly emerging country. That's why in our introduction, we are letting Djibouti tells it's own story. I am Djibouti, strategically located on the Red Sea in East Africa's farthest corner. I am bordered by Ethiopia to the north and northwest, Eritrea to the north and Somalia to the southeast. Lonely Planet describes me as an ideal spot to recharge one's batteries before or after an overland trip to Ethiopia or Eritrea. The Africa Travel Association has chosen me as host country for its 11th Annual Eco Cultural Symposium from January 19-23 It's an ideal opportunity to showcase my travel, trade and tourism attractions to influential contacts from North America, Africa and points beyond. Some say I have the location and potential of becoming another Dubai, which time will tell. Among my most popular visitor attractions is year round diving and snorkeling in the Gulf of Aden with denizens of the deep including Whale Shark. I compare in size to the state of Massachusetts, and my three main regions, include the coastal plain and volcanic plateaus in my central and southern regions and mountain ranges to the north. While Djibouti City, a strategic seaport, has a half million population, two other communities, Ali-Sabieh and Tadjoura are much smaller. If you like warm weather, you will find me a great vacation spot, with November to mid April the best time to visit. Being at the mouth of the Red Sea, with my status as a free trade zone in northeast Africa I serve as an important transshipment location for trade goods entering and leaving the highlands of East Africa. My two official languages are French and Arabic, however Somali and Afar are spoken throughout the country. I have two main population groups, the Issa (Somali) and the Afar, with Europeans, Arabs and Ethiopians in lesser numbers. To be continued. Will Lion of Judah's Engine Roar Again? Sometimes I feel as if "Railways of the World" a series I launched in 1989, started a 'renaissance ' in rail travel. Perhaps it was ESP, because since then, many famous routes have been upgraded or restored, and new lines installed, as countless visitors rediscover the romance of the rails. Like me, these folks savor the fact that getting there is more than half the fun. 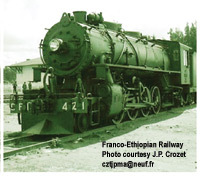 Given Aladdin's 3 wishes, I would restore Emperor Haile Sellasie's 'Lion of Judah' railway engine, hook it up to the prized set of French and British coaches, and operate luxury excursion tours on the Franco-Ethiopian Railway. Built in the 1930s, the 482 mile line stretches from Addis Ababa, via Nazaret, the Rift Valley and Dire Dawa, to Djibouti, a French protectorate on the Gulf of Aden. In a five minute BBC interview, hoping my message would cause a spark, I said, "Think of the much needed income such a tour would generate for the Ethiopian economy." I've followed the last decade's amazing railway renaissance. Away from the busy districts, yet only few minutes from the airport, Djibouti Palace Kempinski is ideally located at a prime beach front between the Red Sea and the Indian Ocean, in a secluded and peaceful setting of palms and bougainvillea. The vanilla colored Hotel's silhouette etch against the turquoise blue of the African sky and the deep Ocean. The fantastic Infinity pool together with a Junior pool maximize the refreshing sea breezes. Djibouti Palace Kempinski features a plethora of entertainment amenities, including a fully equipped fitness center, Mountain Bikes, Outdoor swimming pool, Mini Club, Restaurants and Bars. Djibouti Palace Kempinski redefines luxury service in the Land of Gods! The cargo vessel Shebelle has just docked at the port of Djibouti, carrying dozens of brand-new trucks. Djibouti's Red Sea port is a key African shipping hub Further along the quay, hundreds of porters are splitting a shipment of loose maize into sacks and loading them onto lorries. A knot of camels is standing around in the livestock hangar, waiting to be sent to the Arabian peninsula. This expanding shipping hub is located on one of the busiest maritime trade routes in the world. Landlocked Ethiopia is the main client and Ethiopian Shipping Lines use Djibouti as their home port. It is a major dropping point for World Food Program and USAID supplies, which are transported by road or rail to Ethiopia's capital, Addis Ababa. Ethiopia's cash crop, coffee, is exported in bulk. Now an ambitious investment project plans to turn Djibouti into Africa's biggest shipping terminal, extending its commercial reach throughout East Africa.